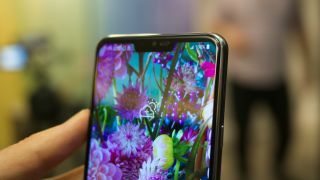 Display notches feature in a number of high-profile handsets in 2018, but come 2019, the likes of the Samsung Galaxy S10 and LG G8 may be able to avoid having to even contemplate the divisive screen cut-out. According to ETNews, both Samsung and LG are now ready to use 'sound-emitting displays' in phones from early next year, having previously shown off prototypes of the technology at the SID (Society of Information Displays) 2018 expo last month. The same report also claims that the Samsung Galaxy S10 screen size would be 6.2 inches, the same as the display found on the Galaxy S9 Plus. The technology would allow audio from an earpiece to resonate on the display of the smartphone, which in turn means there would be no requirement for a front-facing earpiece - one of the main reasons the notch has been developed for phones such as the iPhone X, Huawei P20 Pro and LG G7 ThinQ. That means manufacturers could potentially push the screen all the way to the top edge of devices. It's not just the earpiece that utilizes the notches we're seeing on smartphones though, with the front-facing camera and an array of sensors also hiding in many display indents. However, we may already have an idea of how manufacturers can incorporate these as well. If this technology is already sounding familiar, it's because we've already seen it in action on the recently announced Vivo Nex, which uses the sound-emitting display technology to eradicate the need for an earpiece. Vivo has also been able to embed sensors below the screen, and has implemented a fun pop-up camera to ensure no notch is required. This has resulted in a phone that can boast a 91.24% screen-to-body ratio. The technology is ready, and works, and it's surely just a matter of time before more manufacturers pick it up, which makes the latest report of the tech landing on the likes of the Galaxy S10 and LG G8 all the more believable.